Fuel Poverty Action has been contacted by a number of tenants from social housing estates across London who told us that they are unable to switch their energy suppliers for heating and hot water because their social landlord has ‘locked’ them in to buying from one supplier. 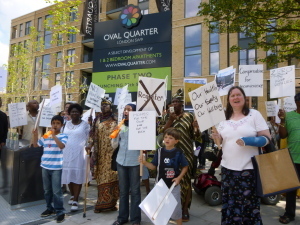 In one case, residents of Myatts Field North estate have been locked in to buying their heating and hot water from e.on for 40 years under a Private Finance Initiative contract agreed by Lambeth council. Last month, Fuel Poverty Action submitted evidence to the Competition and Market Authority who were calling for submissions looking at why people are not switching energy supplier. Fuel Poverty Action used case studies of these housing estates to show that residents are not switching because they have been prevented from doing so by their social landlord. The residents we have spoken with have expressed deep unhappinessness that they are unable to choose their energy supplier and are stuck with the one that has been chosen by their social landlord. The social landlords’ reasons for choosing the particular energy suppliers are not clear to the residents, but getting the cheapest deal for their low-income residents, as they have the power to do, does not seem to have been a factor (former regulator Ofgas, replaced by Ofgem, suggests to social landlords that they could set themselves up as energy suppliers and supply energy to tenants at cost price). When residents have made complaints about the energy supplier monopoly and other problems with the energy supplier to their social landlord, they have not received an adquate response. We are in touch with residents from Myatt Field North estate in Lambeth, Pembroke Park estate in Eastcoate, and a Hackney estate. A resident from Pembroke Park estate said: “As social housing tenants we would like to be treated fairly and not discriminated against. Free holders and lease holders [are not locked in to buying their heating and hot water from Vital Energi] whereas social housing tenants, many of whom are low-income and have disabilities, are locked in to this energy system. We hope whoever is responsible will take this into consideration. It costs £50 for hot water and heating in our home [four bedroom semi-detached house] for 9 days that is the reality. “We would be happy if someone could help us to change the supplier because A2D [housing association] won’t let us do this. The government’s solution to the fuel poverty and energy bill crises has been a mantra of ‘switch, switch, switch to bring down the bills’. Whilst we know that constantly switching will not lower energy costs to an affordable rate, we’re concerned that some social tenants do not have this option to try to get some of the better deals. Whilst we recognise and welcome district power heating systems as being much more energy efficient, we’re very concerned that social landlords are locking their tenants into energy deals that don’t provide their tenants with the low cost energy they need. These energy monpolies are forcing tenants deeper into fuel poverty as they do not have the option to look around for cheaper deals and discounts. Social landlords should be using their role to help alleviate poverty and empower their residents; localised energy could be a part of this if these social landlords were to find the cheapest deal for their tenants and support community-run energy initiatives. Instead, they are making bad deals with energy suppliers without consulting their tenants and are failing to respond to tenants’ concerns. Previous PostPrevious What are YOU doing for Earth Day, Wednesday 22 April?